Protecting email and other corporate data on mobile devices—without bogging down workers—is one of today’s biggest challenges faced by IT pros today. 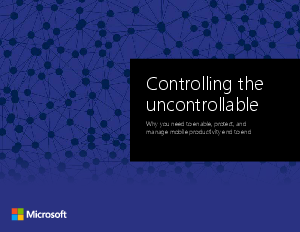 With the massive, global proliferation of mobile devices, it can be a struggle to manage and secure these devices and your data, both on approved enterprise applications and shadow IT. Enables continuous management, so your employees are more productive. Offers threat protection, so you can detect abnormal user behavior, suspicious activities, known malicious attacks, and security issues right away. Provides security after loss or theft of mobile devices. Helps protect your Microsoft Office email, files, and apps.